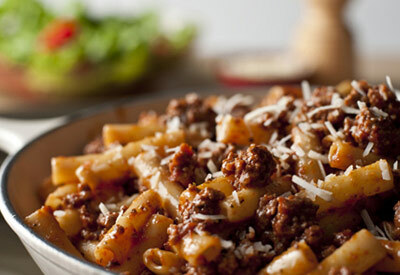 Ground beef and pasta are a winning combination for quick weekday meals that are nostalgic and full of good taste. Cook the beef in a 10- inch skillet until meat is well browned; stirring often to break up the meat. Pour off any fat. Stir the sauce and pasta in the skillet and heat through. Sprinkle with the Parmesan cheese.